Swales vs. Bedford. With the Black king ambling about in the centre of the board it is little wonder that White can win the game. The solution is not straightforward though. Can you find the winning idea for White? Answer in the game viewer at the end of the post. The third round of Calderdale League 1 fixtures took place on the 15th of October and, with all three Hebden Bridge teams in action at the Trades Club there was plenty of action to kibitz! Let’s dive straight in and report on these matches. Hebden Bridge ‘A’ have had a very tough start to the season. They still have at their core the three players who have done the most to secure them the last four league titles: Andrew Clarkson, Martyn Hamer and Phil Cook. 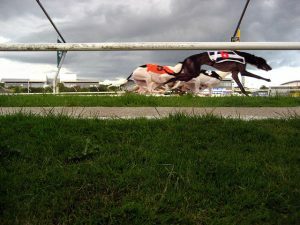 However, their lower boards are weaker this season than they have been in recent years and this is causing them some difficulties for the moment. In both their first two matches they lost on boards four and five. Combined with one other board loss in each match they have been condemned to back to back defeats for the first time in very long time – albeit to two strong sides in the form of Hebden Bridge ‘B’ and Halifax ‘A’. Hebden Bridge ‘C’ probably expected to be somewhere near the foot of the table this season, and indeed, they have managed just a drawn match against Belgrave ‘B’ from their first two rounds. However, this return still saw them sitting above their ‘A’ team before they faced them at the Trades Club last week. On the night Hebden ‘A’ had to contend without Phil Cook amongst their number. This meant that whilst they had Andrew Clarkson and Martin Hamer on boards 1 and 2, Andy Swales was promoted to board 3, Pete Dickinson to board 4 and Terry Sullivan was drafted in to play on board 5 for the evening. Would this be enough to gain a result from their ‘C’ team? Hebden ‘C’ welcomed their captain Martin Syrett into their line up for the first time this season. He played below Andy Leatherbarrow on board 2. Richard Bedford also made his first appearance of the season on board 3 while Paul Gledhill played board 4 and Neil Bamford board 5. All of this meant that, while Hebden ‘A’ looked favorites on the top 2 boards, the other three appeared to be very evenly matched. As it turned out the form books didn’t lie on this occasion. The first game to finish was the board 2 ‘Battle of the Martins’. 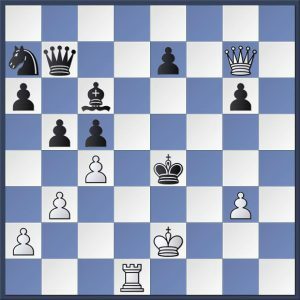 This was over in relatively short order as Martyn Hamer met Martin Syrett’s King’s Indian Defence with a contemporary treatment which saw him expand aggressively with White on the king’s side. 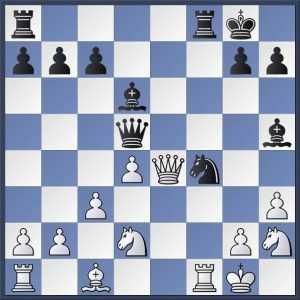 Martin Syrett never really managed to get any counterplay on the queen’s side, or even to get his queen’s bishop and queen’s rook into the game and he made a tactical blunder on move 24 which would see him lose a piece. He resigned without going any further. The other four games were played out over a greater part of the evening and were closely contested. On board 5 Neil Bamford and Terry Sullivan played out an endgame where Neil always seemed to have a slight edge. He managed to convert this into a full point and equalise the match score. Not long after that however, Andrew Clarkson was victorious in the board 1 ‘Battle of the Andrews’ to put the ‘A’ team back in front. This game saw an old and complicated variation of the Scotch Game appear on the board. 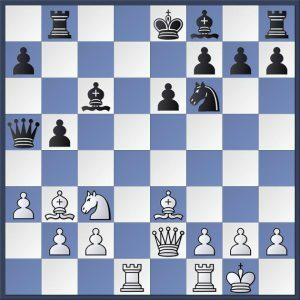 As Andrew Clarkson mentions in his notes to the game (published in the game viewer at the end of this article) the moves followed the original stem game of the so-called Blumenfeld Attack (characterised by 6.Nb5!?) which was first played by Benjamin Blumenfeld in 1903! 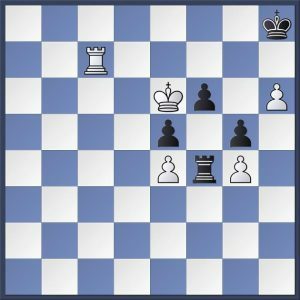 For the first ten moves or so Andy Leatherbarrow seemed to be navigating the complexities well but it seems that Black has the tougher practical challenge in this line and, slowly but surely, his position began to deteriorate. However, Andrew Clarkson then played a few inaccurate moves himself and allowed his opponent to coordinate somewhat before a couple of dodgy moves in succession cost Andy the game. Hebden ‘C’ drew level once again when Richard Bedford saw off the spirited challenge of Andy Swales on board 3. In some sort of Pseudo Catalan position, Andy was the first to go astray when he appears to have miscalculated a tactical sequence which saw Richard grab a pawn. In exchange for that pawn however Andy got a half open h-file to work with and he quickly went about trying to exploit this by rearranging his fianchettoed bishop to f3 and put his king on g2 in its place. Then, another confusing tactical sequence caused a further material imbalance as Richard gave back his extra pawn but won a knight and bishop for one of Andy’s rooks. Dickinson vs Gledhill. Black to move. Can you find the correct winning method? Answer in the game viewer at the end of this post. Further excitement was to follow as Andy managed to drive Richard’s king into the open board on e4! The situation seemed most perilous, but this point of the game was reached with both players in time trouble and Andy missed a couple of winning continuations just before and then again just after the time control. 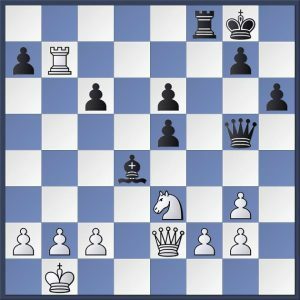 (Take a look at the game position top right and see if you can find the most clinical finish for White. The solution is in the game viewer at the end of this post.) Finally, the game simplified and Beaky was able to convert the ending. It was tough luck on Andy who has played some interesting and decent chess for his new team so far this season but has yet to show any results for it. Finally, the board 4 match-up between Pete Dickinson and Paul Gledhill was the point on which the match would pivot. By the time the other games had finished these two had reached a same coloured bishops and pawns ending in which Paul had an extra pawn. It looked for all the world like Paul would win the match for Hebden Bridge ‘C’ and heap more misery on their ‘A’ team, but as the evening draw to a close, Paul was unable to find the winning method (can you do better in the second diagram on the right?) and agreed to a draw which left honours even between the two sides. Meanwhile, on the next row of tables, Hebden Bridge ‘B’ were taking on Huddersfield ‘A’. Most unusually for the Calderdale League, Hebden ‘B’ were the only team with a 100% record after two rounds. Huddersfield meanwhile had suffered a disaster at the hands of their ‘B’ team before pretty much getting a walk over against Halifax ‘A’ at home. The visitors brought a strong side with them though as Messrs Eagleton, Keddie, Westmoreland, Sykes and Tooley looked like they would give the home side a stern test. The first game to finish was the board 1 clash between Greg Eagleton and Matthew Parsons. These are two of the strongest players in the league and, as you might expect, a fair degree psychology came into play from the very beginning of the game. For a start, Greg played 1.e4 which is certainly not his regular habit and this suggested to Matthew that his opponent must have prepared something to play against his Caro-Kann Defence. 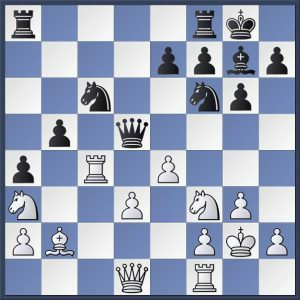 Indeed, Greg had prepared something, but Matthew dodged this prep by opting to take a road less travelled in the form of 4…Nf6 (instead of 4…Bf5 or 4…Nd7 which are more frequently seen and must have been what Greg had prepared for.) With the psychology now over, the two played in a very respectful fashion and agreed to peace terms as early as move 19 with the position level. The other four games in the match went on deep into the evening and were closely contested although play was remarkably ponderous. No better indication of this was that the longest game of the match was concluded on move 37, yet all four of them finished after 10pm. This also meant that they finished in a relatively short time frame in the run up to the time control at 10.15. First to finish was the game between Nick Sykes and Sam Swain on board 4. The queens came off the board as early as move 7 but that in no way led to an arid and featureless position. Sam found himself saddled with an isolated e-pawn and this was the basis for Nick’s play. It looked like was making in-roads to the Black position but Sam defended resourcefully until, somewhere around move 20, Nick misjudged a complicated tactical melee, lost a piece and resigned without continuing any further. 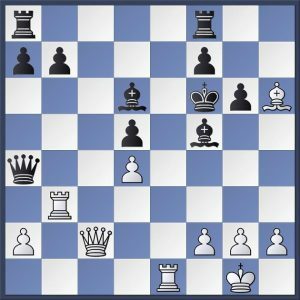 On board 3, Pete Leonard and Steve Westmoreland also contested an English Opening which then transposed into a sort of Neo-Grunfeld where White plays g3 and fianchettos his king’s bishop. This was a tense game with both players using plenty of time to reach move 20. With both sets of knights off the board, Pete seemed to manage to get his bishops and rooks coordinated more swiftly and managed to grab a pawn before pushing his now passed d-pawn up the board. Both players made some inaccurate moves in the time scramble but it was Steve who made the last mistake as he grabbed an exchange that enabled Pete’s d and e-pawns to swap files and gallop towards the back rank. Once the players had agreed that time control had been reached Steve saw that his position was lost and resigned. Hebden Now had the match hand with 2½ points. Neil Suttie pushed them over the line shortly afterwards when he agreed to a draw with Dave Tooley in what was another tense and complicated struggle. Both players were down to almost no time on their clocks with moves still to make to get to the haven of time control when they decided to agree to a draw. Finally, Dave Shapland sealed the home side’s victory when he beat Dave Keddie on board 2. This one was another queenless middle game from a 2.c3 variation of the Sicilian Defence. 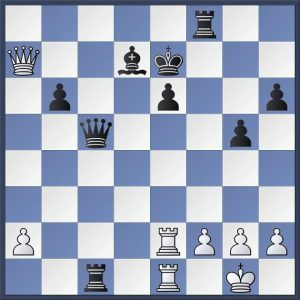 The Hebden player managed to equalise early in the game, created a weakness in the White camp in the form of doubled, isolated f-pawns and then with the tension building up in the centre of the board, found a way to win a pawn. The game simplified down to a rook and bishop (for white) against Black’s rook and knight plus an extra pawn. Objectively it might have been possible for Dave Keddie to hold it but it was very tricky as Shapland’s knight had several wonderful outposts available to it from which it could not be opposed. Finally, Keddie decided to try and defend through active counter play. It was worth a try but Shapland manage to calculate through the variations, ran his king up the board and finally forced the win with his opponent’s monarch penned in on a1. You can find nine of the games from these two matches in the game viewer at the end of this post. Last night League 1 teams play their fourth round and so we’ll report on those matches, plus the intervening round of League 2 fixtures later this week. As mentioned in last week’s post the second of six (!!) Hebden Bridge derby matches in League 1 this season was postponed from last week until Monday evening. It was worth the wait though as no quarter was asked for and none was given as all five boards in the Hebden Bridge ‘A’ vs. Hebden Bridge ‘B’ match saw a decisive result and some interesting and enterprising chess was played. Of course, the fixture was only paying lip service towards being a real derby as Hebden Bridge ‘A’ are based in Todmorden at the Golden Lion. Last season Golden Lion had been beaten at home by the same opponents. It was the only match they lost as they clinched their fourth successive title. Hebden Bridge finished four points behind them in second place. It would be reasonable to assume then that these two sides should be in the mix for the title race again this season. This time around the situation was somewhat different. Hebden bridge ‘B’ had started their season with a resounding win against their ‘C’ team while Hebden Bridge ‘A’ had lost out to Halifax ‘A’. However, the Todmorden-based team still sported a very strong line up with the spine of their quadruple title winning side all present. Andrew Clarkson was on board 1, Martyn Hamer on 2 and Phil Cook on 3. They were joined be Andrew Swales and Pete Dickinson. Swales is new to the team this season, but Dickinson played some games on board 5 last year and performed well. Hebden ‘B’ meanwhile, whilst not having the same ordnance on all the top boards, certainly had strength in depth. Matthew Parsons played on board 1, Dave Shapland on 2, Pete Leonard on 3, Sam Swain on 4 and Neil Suttie on 5. This meant that the ‘B’ team were stronger on paper on the bottom two boards, weaker on boards 2 and 3 and then slightly stronger again on the top board. If the over the board encounters were as finely matched as it looked in the grading of the players then it was going to be a tight match. And so it proved to be. All the games continued well into the second half of the evening and the results on all four boards were by no means pre-ordained. It seemed that Hebden ‘B’ would need to win at least one of the bottom two boards. In the end they won both. In the first result of the night, Neil Suttie built up methodically and sensibly against Pete Dickinson’s Philidor Defence. He managed to force Pete’s pieces into disharmony and was then able to take advantage of that with a nice combination starting with 20.Ng5. After Black’s response 20…Rg6 see if you can spot Neil’s continuation in the diagram on the right. After this the game drew to a swift conclusion. Sam followed up on Neil’s good work with a slightly different sort of win. 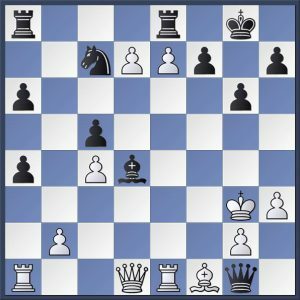 A highly complicated Chigorin System of the Ruy Lopez appeared on the board. Andy seemed to be making some progress with Black but then, just as had happened on board 5, his pieces seemed to somehow get in each other’s way whilst Sam’s were operating harmoniously. This led first of all to White winning a pawn and then, a little later, Andy was compelled to give up the exchange to prevent his queen from getting trapped. After that Sam was always in control even thought the complications persisted for a while longer. Finally, Sam forced simplifications and Andy resigned when he made a blunder in what was already a lost position. It was 0 – 2 to Hebden ‘B’, and it seemed that they needed the buffer for by the time Sam had won his game, Pete Leonard had a losing rook and pawn ending on the board against Phil Cook and Dave Shapland, just like Andy and Pete before him, gotten his pieces in a tangle and was forced to give up his queen for a rook and bishop. Unlike Andy and Pete though he did have some counter play and a very resilient looking defensive position. This all meant that the result on board 1 was absolutely critical to the outcome of the match result. Andrew had ventured a pseudo King’s Indian position against Matthew’s inevitable London System. This way of approaching the London has a decent reputation and indeed Andrew appeared to be holding his own only for Matthew to slowly out play him and exchange one type of advantage for another until he finally sealed it in a rook and pawn ending. By this time Pete had lost and Dave was only writhing in agony before Martyn dealt his death-blow but the result was no longer in doubt. Hebden ‘B’ had managed to beat the title holders away for a second successive season. All the games from the match can be found in the game viewer below. Thanks to Andrew Clarkson and Matthew Parsons who have both annotated their game from Monday night. This result means that Hebden Bridge ‘B’ are the only team with a 100% record after just two rounds! A most unlikely state of affairs. Belgrave ‘A’ are next in the table on 3 points. Then come Belgrave ‘B’, Huddersfield ‘B’, Halifax ‘A’ and Huddersfield ‘A’ on 2. Hebden Bridge ‘C’ have 1 point and Hebden Bridge ‘A’ are yet to get off the mark. Next week the bottom two teams will play the last of the Hebden Bridge derby matched before Christmas while the top team host Huddersfield ‘A’ in what promises to be another tight match. Belgrave ‘A’ vs Halifax ‘A’ and Belgrave ‘B’ vs Huddersfield ‘B’ completes the fixtures. This week also saw a second round of fixtures played in League 2. In this Belgrave ‘C’ crushed Halifax ‘C’ 1 – 4 with ‘Super’ Steve Harrington registering his fourth win out of four in both leagues so far this season. Chris Edwards and Paul Jacobs also won their games while boards 1 and 2 were drawn. At the Trades Club Brighouse went one point better to whitewash Hebden Bridge ‘D’s line up of juniors and Huddersfield ‘C’ registered a walk over when Halifax ‘B’ defaulted their match. All of this means that the new outfit, Huddersfield ‘C’ and the old stagers, Brighouse sit atop the League with 4 points. Belgrave ‘C’ and Halifax ‘B’ have 2 points and Halifax ‘C’ and Hebden Bridge ‘D’ have no points. On Monday night the Calderdale Evening Chess League started up again as a round of League 1 fixtures were played. As is always the case where any club has two or more teams in a division they are drawn to play each other in the first fixture of the year to ensure there can be no hint of collusion later in the season. This season Hebden Bridge, Huddersfield and Belgrave all have two teams. Hebden Bridge actually have three with the team based at the Golden Lion now part of the club and named Hebden Bridge ‘A’. As Golden Lion were last season’s champions (their fourth title in succession which is a feat only ever bettered by Courier ‘A’ who won the Anderson Trophy five successive times between 1986-87 and 1990-91) let’s start with them. At the core of the Golden Lion team is the same spine that has helped them to those last four league titles, Martyn Hamer, Andrew Clarkson and Phil Cook. This year though their top scorer from last season, Dave Shapland, has based himself back at the Trades Club as Captain of Hebden Bridge ‘B’ and David Innes and Marc Turu, who played on board five between them for most of last season, have both moved on. In their stead came Andrew Swales and Jon-Paul Ellis who occupied the bottom two boards as they hosted Halifax ‘A’. Halifax have had a turbulent few seasons themselves. They used to have a trio of super strong players on the top three boards themselves but Winston Williams and Darwin Ursal were both missing last season and the team felt their loss keenly. However, for this first match of the season, Winston was back on board 1 and with Bill Somerset on board 2, Richard Porter on 3, Carlos Velosa on 4 and Sam Scurfield on 5, Halifax had a stronger line up than they’d managed to put out at any point in 2017-18. Porter vs. Cook. White to move. It was always likely to be a tall order for Hebden ‘A’ on the lower boards and they weren’t helped when JP lost his game quickly and somewhat noisily. Unfortunately, this caused some distraction to other players on both sides and Andrew Swales lost his game shortly afterwards. This put the top three Hebden ‘A’ players under a great deal of pressure and the remaining games went on long into the night. They could very well have pulled it off. Martyn managed to beat Winston, Andrew had Bill on the rack for significant chunks of the evening only for his adversary to defend himself stoutly and resourcefully to hold the balance and a draw. This just left Phil cook and Richard Porter to decide the match. If Phil could win the match would be tied. Nay other result and Halifax would steal the win. Phil was a piece and a pawn up when he made time control and all looked well but it seems he may have drifted back into time trouble for he made a most uncharacteristic blunder on move 41 and this basically cost him the game on the spot as Richard spotted a nice tactic. See if you can find it in the position on the right. So, an early season set back for the reigning champions that will give the other teams in the League this year hope of stealing their crown. There is a long, long way to go though. Meanwhile at the Trades Club Hebden Bridge ‘B’ were playing their derby match against Hebden Bridge ‘C’. Hebden ‘B’ welcomed back the strongest player in the league (on paper at least) in the form of Matthew Parsons. Dave Shapland, Pete Leonard, Sam Swain and Neil Suttie made up their formation. Hebden Bridge ‘C’ had the luxury of having more players than they needed and so their Captain, Martin Syrett generously sat the match out to enable others to play. The ‘C’ team lined up with Andy Leatherbarrow, Neil Bamford, John Kerrane, Terry Sullivan and Luca Curry. With significant differences in the players ratings on all the boards this match always looked like it would be a tough challenge for the ‘C’s but they’ve been known to cause derby upsets before and they put up spirited resistance before succumbing on this occasion. The first game to finish saw Dave Shapland take advantage of some early season rustiness on Neil Bamford’s part to win swiftly but the other games all went on much, much longer. On board 3, the lack of ‘match fitness’ (if you can call it that!) showed itself even earlier as Pete Leonard confused two different variations of the Grunfeld Defence and lost a pawn as early as move 6. Sometimes, this kind of thing can be overcome but John Kerrane maintained his material and restricted Pete’s counter play for quite a long time. Later in the game he gave Pete a glimmer of hope before finding the right way to close out the game with some good technical play. The match was level. Sadly, that was as close as the ‘C’ team got. First, Matthew sealed a fine win with the King’s Indian Defence by finding a very smart pretty tactic. See if you can spot it in the diagram on the right. Then Sam saw off Terry in the endgame before Neil did much the same against Luca although he had held a material advantage for a significant chunk of the evening. The third match to take place on Monday night was the one between Belgrave ‘A’ and Belgrave ‘B’. Again, on paper this looked like it should have been straight forward for the home team, but, playing Black and with a rating advantage on every board but board 5, they struggled greatly. Gordon Farrar continued his strong recent form by holding Ian Hunter to a draw on board 1. New recruit Keith Marsh and Les Johnson did the same to Dave Patrick and Malcolm Corbett respectively. Meanwhile, the only player in the ‘A’ team line up to have a lower rating than his opponent (Steve Harrington against Angel Gonzales) won his game and this left Karim Khan with the task of holding Dave Colledge to a draw to squeeze out a win for Belgrave ‘A’. Sadly he was unable to manage it and Dave won the last game of the night to finish as the ‘B’ team took a very creditable draw indeed. On Wednesday night Huddersfields ‘A’ and ‘B’ teams were due to meet but (perhaps unsurprisingly given their recent history) the fixture was postponed until next week. We will try and bring you that result then. League 2 starts next week and the good news is that Huddersfield have been able to belatedly enter a ‘C’ team to the League which means that there won’t need to be a team taking a bye in each round of matches. Very welcome news that and so Hebden Bridge ‘D’ will host Huddersfield ‘C’ next week. 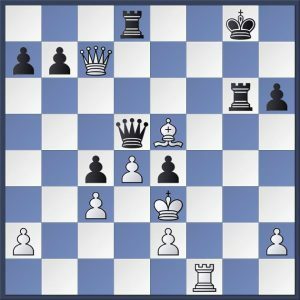 This position from Shapland vs. Wells, Blackpool Congress was considered in our Analysis Evening earlier this summer. It’s White to play. What would you do here? Find out the best move in the game viewer at the end of this post. It’s been a little over three months since we last posted on this website and your editor has enjoyed something of a summer break. However, with a new season looming, it’s time to brush the cobwebs away from my keyboard start posting again. 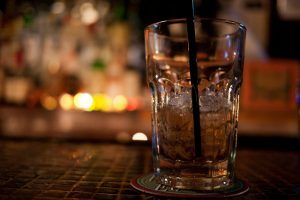 I thought it might be a good idea to briefly recap and reflect on some of things that have happened since our last post in May. The final chapter of this year’s summer programme will take place on Monday 3rd of September when our annual Lightning Championship will be staged. PLEASE NOTE, this is going to take place at The Golden Lion, Fielden Square, Todmorden as the Trades Club is unavailable. Please do try and join us for what is always an enjoyable evening. Remember, Lightning Chess is played with a buzzer sounding every 10 seconds to regulate when each move must be played. Round 1 will start as soon after 19.30 as possible so do try and arrive at The Golden Lion before then if you can. Now that we have that out of the way lets quickly list the winners and losers from last season’s action. 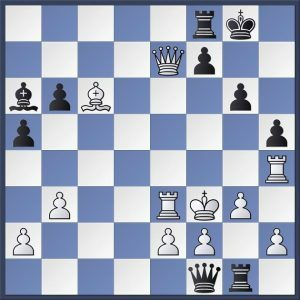 Eagle-eyed observers have noticed that the Yorkshire Chess website has disappeared. Is it ever to return they ask? It’s unlikely at this time we think. Essentially it had been operating on the good will of the webmaster (who was funding hosting costs out of his own pocket) and a small editorial team of volunteers. When the Yorkshire Chess Association either dithered, or declined, to cover ongoing costs it expired. 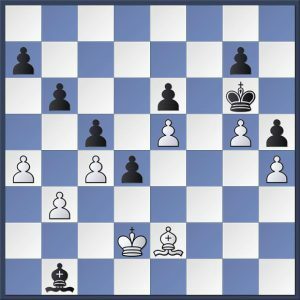 There is something of a replacement in the form of Steven Mann’s website about Yorkshire Chess which now includes a page for the Yorkshire Chess Association. (There is also a link to this site in the ‘Useful and interesting websites’ list on the right of this page. Additionally, the YCA Grading website though still live now, is essentially being archived this year. Jon Griffiths, who has done sterling service, has retired as the Grading Officer for the Yorkshire Chess Association and with him goes the website. You can still go to the site to check you current rating which will be used as the starting rating for Calderdale fixtures this season. However, the ratings here will not be updated and no more league results will be added. The site will disappear completely in 12 month’s time once the English Chess Federation (ECF) ratings supplant the local ratings. The situation with the Yorkshire grading website left all the leagues in Yorkshire with critical decisions to make at their AGMs over the summer. The only way to get games graded centrally now is via the ECF’s Grading Officer for Yorkshire and that means that all players in the league must become members of the ECF. The only alternative is to grade league games locally in order to avoid ECF membership fees. At the Calderdale AGM this was considered and discussed at length with some of those present feeling that lower rated, occasional players only playing in the Calderdale League would be unwilling to spend £16 to join the ECF as Bronze Members. Others pointed out that regular participants in the Calderdale, Bradford, Huddersfield, Leeds and Yorkshire Leagues would want all their games to go towards one single rating and may decide to play elsewhere if Calderdale didn’t follow the suit of the other Leagues, many of whom are already affiliated to the ECF. Finally, it was agreed that Calderdale League 1 games would be rated by the ECF and that, for this season at least, League 2 and the Handicap League would not be ECF rated. This decision will be reviewed again at an EGM meeting next year. The upshot off all of this discussion is that any player taking part in Calderdale League 1 matches this season must become an ECF Member. Bronze Membership costs £16 (£5 for Juniors) and you can join online via the new membership portal. The link has been added to the list of ‘Useful and interesting websites’ on the right. If you plan on playing in Congresses as well this season then you should become a Silver member (£23.50 or £5 for Juniors) to have those games graded otherwise you will be charged an additional entry fee by the Congress organisers in order to get your games graded. So, if you are playing in League 1 this season please join (or renew your membership with) the ECF at your earliest convenience. The membership year starts on September the 1st. At our own club AGM this summer it was agreed that we would absorb the players of the Golden Lion team into our club. This was done primarily to allow the team to continue playing home matches in Todmorden whilst benefitting from the necessary organisational structure of Hebden Bridge Chess Club. It will also allow some of our other members who live in Todmorden to join this team if they wish to do so. The Golden Lion will continue to be the base for the team but please note that it is now known as ‘Hebden Bridge ‘A’ on the new Calderdale League website were you can find all of the scheduled fixtures for this season. At the club AGM it was also agreed that the League 1 teams (Hebden Bridge ‘A’, ‘B’ and ‘C’) will now be administrated in part by an online service called Teamer. If you are invited to play for any of these teams you will receive an invitation (by text or email) to join the club’s Teamer web pages. You will also be notified and invited to play in matches via the Teamer service and you will be able to accept or decline these invitations by text or email or by logging onto the website. There is also a smart phone app available that you can use and receive notifications this way. We plan to trial this for a year and then gather feedback from members to see how they liked using it at the end of the season. It will hopefully reduce the time and effort needed for the Captains to organise their teams but it won’t entirely replace the need for phone calls. Basically, if you don’t respond to the invitations we’ll pester you by calling instead! If you have any questions or concerns about how Teamer works please email us hebdenbridgechessclub@gmail.com or speak to Dave Shapland at the club sometime. Our summer programme of events and competitions has been continuing as usual over the last few months. 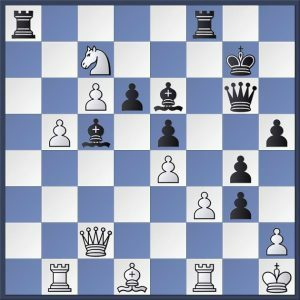 In July, Dave Shapland presented a game from the Blackpool Chess Congress which he took part in back in March and came joint first in his section. The game was from the critical fourth round and several members have asked for it to be published here for further study and entertainment. You’ll find it in the game viewer at the end of this post. Last Monday we held a simultaneous match against our strongest player, Matthew Parsons. The turn out this year was excellent with 11 members coming along to try their luck against Matthew. Here’s a brief report from John Kerrane. On Monday evening, Hebden Bridge Chess Club’s strongest player, Matthew Parsons, took on eleven other club members in a Simultaneous Exhibition, as part of the club’s Summer Programme, at the Trades Club, Holme Street. Playing all eleven players at once, and making moves on each board in turn, Parsons seemed to have no trouble in establishing superior positions on most boards, but two stalwarts of the club’s C team, Andy Leatherbarrow and Martin Syrett, both fought back and eventually won their games. The rest of the company weren’t so successful, and Parsons finished the evening on 9 wins out of 11, a pretty impressive score line. Parsons is a popular colleague, and members were relieved to hear that he has decided to continue playing for Hebden Bridge next season! Considering how difficult it is to take on so many opponents at once, and having performed so well, it seems terribly unfair to only publish one of Matthew’s defeats from Monday night and yet, we have done so! Andy Leatherbarrow’s win can also be found in the game viewer at the end of the post. Magnus Carlsen will take on his latest challenger, Fabiano Caruana in a 12-game match in London this November. The venue and schedule was announced last month. 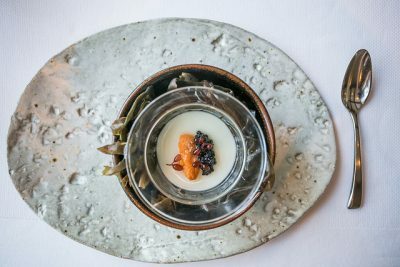 This event offers a unique opportunity to sample the atmosphere and tension of a World Championship match. Your editor attended a game from the Kasparov vs. Kramnik match in London in 2000 and can heartily recommend it to anyone who’s got the inclination to take a day trip to London for it. 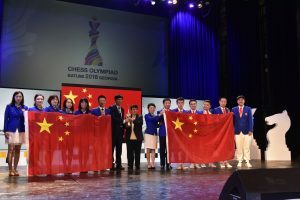 Tickets and further information can be found on the World Chess website.